Week three. 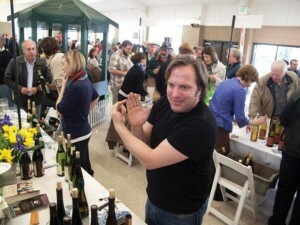 We’ve been emailing and Tweeting and Facebooking people all over the country, coordinating our future tastings. It’s a bit more complicated than we thought (damn shipping laws). Time was ticking away for the next post and We were a bit nervous…when a perfectly simple email arrived: “Alright, I’m in.” Sean O’Keefe of Chateau Grand Traverse preempted our “Yikes, which state is next?” dilemma by shipping four bottles our way. Thank you, Sean. We were immediately intrigued by the fanciful labels. And all these images of hands. A little internet research and what do we find? A picture of Sean’s hands. We also found lots of accolades. Sean is a man proud of his wine and the state it’s made in…for good reason. Before we embarked on this tasting tour We had no clue such food friendly, delicious stuff could come out of Michigan. It’s the beauty of the project: discovery. He said: We found out the other day that they make wine outside of the state of Michigan. She said: Umm…Are you going to joke about that every podcast? She said: Very pale salmon color, quite translucent. On the nose: intense maraschino cherry, some honeydew melon, and vanilla. Nice kick of acid to keep the wine fresh, but definite sense of sweetness throughout–from nose to lingering finish. On the palate the cherries again with creme cassis. In fact, the wine reminds of a kir. Imagine hot summer afternoons by the pool–it’s a fresh and fruity easy drinking wine. He said: Cherry on the nose. This is a strange (and delicious) wine. I can taste the Pinot Noir. Very tart cherry again in the mouth. I need to mention that I love this label. Actually, all 4 bottles look beautiful. Good job. MichiganByTheBottle said: Another distinctive offering from Chateau Grand Traverse. This white wine is made from dark red/black grapes. The color is rusty and more salmon tinted. I get deep flavors of tart black cherry, with a real bite on the end. The finish is nice and long. It is not as crisp or refreshing as Dry Riesling, but it has a lot more body. I would call this a red wine drinker’s white wine, and it is easily my favorite of the bunch. She said: Very pale straw yellow. In the nose: citrus, sour cherries, almond extract/apricot pit. Very refreshing and light with a great acidic kick in the end. Watermelon rind and wet stones. Excellent food wine–imagining sushi, spicy Thai, grilled fish, fruit salad. Another wine that makes me think of being poolside. Or maybe I just really want it to be pool party time again. He said: Very pale. Citrus, apricot and a little heat on the nose. Tastes great, like no other wine I have ever tasted. 13% alcohol with almost no heat in the mouth. Very balanced with a nice acidic taste in the finish. My favorite of this bunch. MichiganByTheBottle said: I overhead some Michigan wine personalities talking about how this is one of their favorite Michigan whites. The combination of Pinot Blanc, Pinot Gris, and Pinot Noir really work well together to create a light and crisp wine. The aromas surround the bowl almost immediately. I get hints of strawberry and citrus. This could very well be the perfect Summertime wine to pair with a salad or grilled fish. She said: Very pale yellow with a tinge of green. Aromatic on the nose: spring flowers, citrus, honey, and wet stones. Bracing acidity. Fresh and lively–another terrific food wine and my favorite of the bunch. Granny Smith apple, honeysuckle, minerals. A slight frizzante. It’s bone dry, but the aromatics keep it interesting. Enjoyed it with French toast with stewed prunes and mascarpone brunch. Fantastic combo. He said: Bone dry. Green apple, citrus and floral on the nose. It’s so dry that it hardly feels like it stays in your mouth. It confuses me, but I really like it. Even if I can’t describe it. MichiganByTheBottle said: Dry Riesling is my favorite style of Riesling, and this selection does not disappoint. The bouquet is very aromatic with strong scents of green apple. I get a lot of tart pear on the tongue. Although it is dry, the fruit really shows through. It has a nice long refreshing finish. This would go great with sushi smothered in wasabi. She said: Pale straw yellow. Subtle honeysuckle perfume and stones on the nose. High acid, apple, ripe pear, melon. Reminds me of SweeTarts–a candy I love (and I’m not a candy person). There is some residual sugar, but it makes for a terrific balance to the bracing acid. This may be my favorite of the bunch. He said: Very floral on the nose. Wow, it almost feels carbonated in the mouth. The frizzante is tickling my tongue. I have described the fizz of Txakoli wines as pop-rocks, and this has the same feeling. There are flavors of grapefruit. Really refreshing. MichiganByTheBottle said: I love unique wines, and this fits the bill. The grapes are pressed whole without destemming or crushing, adding some of the earthiness that I love in wine. This is slightly sweeter than the Dry Riesling. The best description that I could give it is grapefruit with a kick! It is very spicy with hints of ultra-ripe red apple. The finish isn’t quite as long as the Dry Riesling, but there is still a lot of flavor coming through. MichiganByTheBottle said: Chateau Grand Traverse is one of our favorite Michigan wineries. Ed O’Keefe was truly the pioneer of grape growing on Old Mission Peninsula. Sean O’Keefe pointed out that these four wines are not necessarily hit best-selling wines, but are definitely some of his most interesting. I strongly believe that Michigan wines are generally overlooked not because of the quality but because of the marketing and exposure. 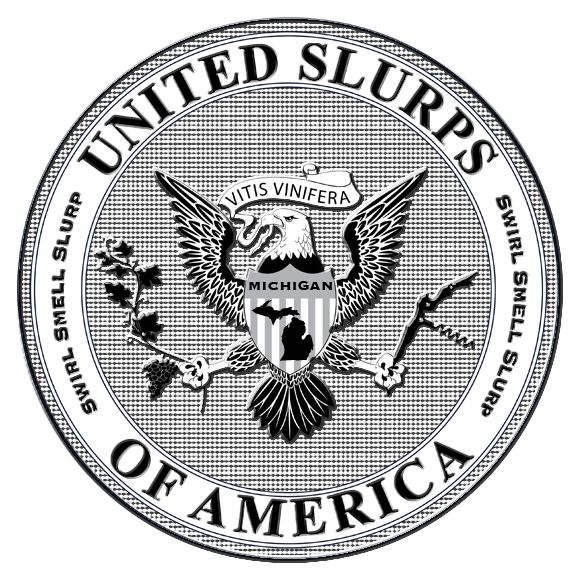 It is going to take more wine blogs like Swirl Smell Slurp to help highlight some of the lesser known regions doing great things with grapes. We said: Thank you to Shannon and Courtney of MichiganByTheBottle & Sean O’Keefe of Chateau Grand Traverse for being part of USA: MI. The wines were delightful. We admire the efforts by both of you in promoting the state’s industry. Go Michigan. And We’re very curious about the reds. Perhaps a MI.2 is in order?